After celebrating the truffle harvest at the annual White Truffle Fair in Alba, Italy last month, we have a whole new appreciation for the prized delicacy and were excited to hear that a local master French chef would be preparing a multi-course dinner using the valuable fungus. 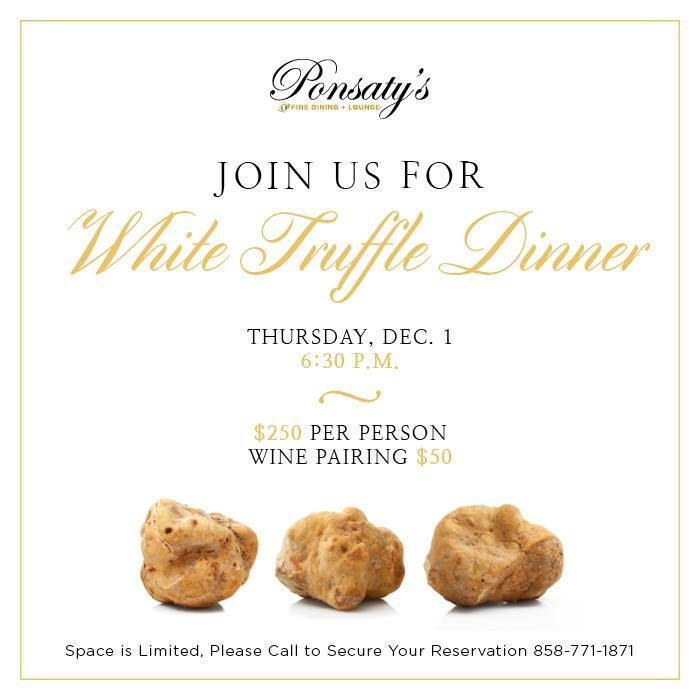 Ponsaty’s Restaurant in Rancho Santa Fe’s will celebrate the upcoming holiday season with a White Truffle Dinner on Thursday, December 1, starting at 6:30pm. Master French Chef Patrick Ponsaty will create must-have dishes including pheasant and duck liver mousse with truffle carpaccio, Aspen Ridge beef tournedos filet served with Maine lobster and white truffles, Dover sole soufflé with white truffle risotto and a chicken reduction, and poached veal shoulder blanquette with winter vegetables and white truffle velouté sauce. Diners can polish off the evening with the palate-pleasing dessert - white chocolate and white truffle with aged Madeira aspic and poached Seckel pear. Venture out of the normal and try Chef Patrick’s Inspirational truffle menu. This meal will certainly be a most memorable culinary experience. The truffle dinner is priced at $250 per person plus tax and gratuity and an optional wine pairing is available for $50 per person. Reservations are required and can be made by calling the restaurant. For more information on Ponstay’s and their menus, call 858.771.1871 and visit ponsatys.com.